Knowing when your Spring golf cart maintenance should start to ensure a golf cart that runs all summer long is important. When should I water my batteries? Brand new batteries will use very little water at first, but with average use, will need water about every other month. During the summer please check your batteries once a week. The humidity and extreme weather will evaporate water at a faster rate than during cooler months. As the batteries get older, it takes longer for for it to reach a full charge, thus using more water more frequently. For more Spring golf cart maintenance tips, click HERE. • Open the vent caps to check the fill wells; the minimum level for the solution is the top of the plates. • If the level is below the plates, then add just enough water (distilled) to cover them. • Charge the battery completely, and check the electrolyte level again. • For best results, clean all vent caps before replacing them. Be sure they are tightly secured into place. • Use only distilled water for golf cart batteries. Throughout their lives, electric vehicle batteries may use up to a full 16 quarts of water. Using non-distilled water results in a buildup of minerals in the batteries that can negatively affect performance and lifespan. Undercharging: Leaving the golf cart inactive for over 2 months will reduce the battery life. Continually operating the battery in a partial state of charge, or storing the battery in a discharged state result in the formation of lead sulfate compounds on the plates. Sulfate: Sulfating reduces the battery’s performance and may cause premature battery failure. Overcharging: Continuous over-charging causes accelerated corrosion of the positive plates, excessive water consumption, and in some cases, damaging temperatures within a lead acid battery. Deep cycle batteries should be charged after each discharge of more than 50% of the batteries rated capacity, and/or after prolonged storage of 30 days or more. Under-Watering: In a deep cycle lead acid battery, water is lost during the charging process. If the electrolyte (water/acid) level drops below the top of the plates, irreparable damage may occur, as the plates will get hot, warp, and crack leaving the battery weak and inefficient. Water levels should be checked and maintained routinely. Over-Watering: Excessive watering of a battery results in dilution of the electrolyte, overflow, reduced battery performance, and unnecessary maintenance which may be messy and damage the floor. Custom Golf Carts Columbia is the #1 leader in Spring golf cart maintenance tips in beautiful Columbia, SC and the surrounding Southeastern states. We offer a wide selection of new and used golf carts, parts, service and accessories to meet all our customers’ needs at affordable prices. 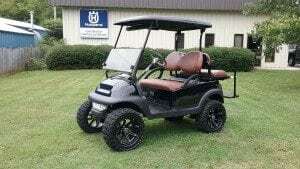 We can adapt any golf cart to your specific interests and offer all parts and servicing you may need to keep your cart running at top performance. Custom Golf Carts Columbia has a friendly, knowledgeable staff and a hassle free environment to provide our customers with an easy, convenient buying experience. Browse online at what we have to offer or call us and speak with one of our customer sales representatives. Visit us at 519 Chapin Rd, Chapin, SC 29036 or call us at 803-941-7523 today to get your golf cart ready for Spring!